Autism is one of the fastest growing diagnoses for developmental disorders in the world. Cruise lines understand it is important to cater to these special needs so that everyone in the family has a memorable vacation. *Services may vary from ship to ship and should be verified at the time of booking with your special needs agent. 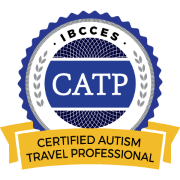 Vacations To Go is a Certified Autism Travel Professional recognized by International Board of Credentialing and Continuing Education Standards.